Polytechnic Admission Circular (Diploma in Engineering) Admission-2017 published. Directorate of Technical Education Diploma Engineering Polytechnic Admission Circular and Notice 2017-18 Will Publish at www.btebadmission.gov.bdwebsite. All Students will have to apply through online and pay admission fees through mobile SMS. Diploma Polytechnic Admission Circular 2017-18 will be found here. There are 2 (two) Categories Admission system 1st Shift and 2nd Shift Batch Admission. After a complete 1st shift admission, then 2nd shift will be started. The Authority of Directorate of Technical Education Published 2(Two) Admission circular 2017. Polytechnic 1st Shift Admission Circular 2017 and Polytechnic 2nd Shift Admission Circular 2017 aslo publish on this post. Interested Students are Apply Within Deadline. Polytechnic Admission Circular 2017. At First Students must pay fee 150 taka 24 hour before online application. Application Fee pay by Teletalk Mobile. 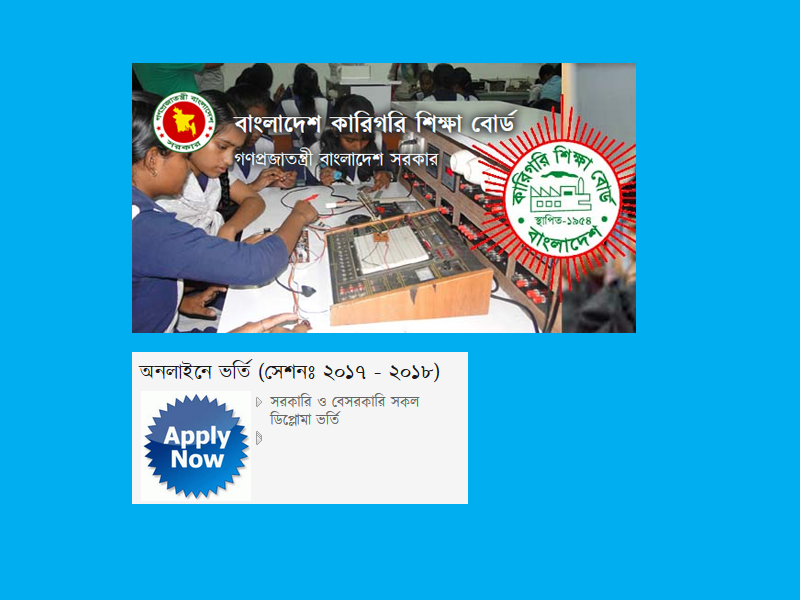 Visit Directorate of Technical Education Diploma Poly Technical Admission website www.techedu.gov.bd Home Page. Then Click here Online Admission (First Shift) button and Open Application Form. Fill up Application form and Click Submit. btebadmission gov bd. www app btebadmission gov bd subject canig. www btebadmisson com. Diploma engineering admission 2017 bd. diploma in engineering application bd 2017. btebadmission. btebaddmission. www techedu gov bd. Diploma serkula 2017 bd. dtedadmission gov bd. diploma in engineering admission 2017. Government of technical admission form 2017-18. diploma admission site powered by teletalk. deploma in engineering gov bd. btebadmssion gov bd. Btebadmisson Gov/bd 17-18. btebadmission result 2017. btebaddmision com. bteb admission admit card 2017. Bimt admission gov bd(2017-2018).